Planning for the new stadium began in the mid-1990's to replace the existing Veterans Memorial Stadium (now the main parking lot). The original stadium was built in 1949 and served the team well through the 2001 season, a total of 52 years! 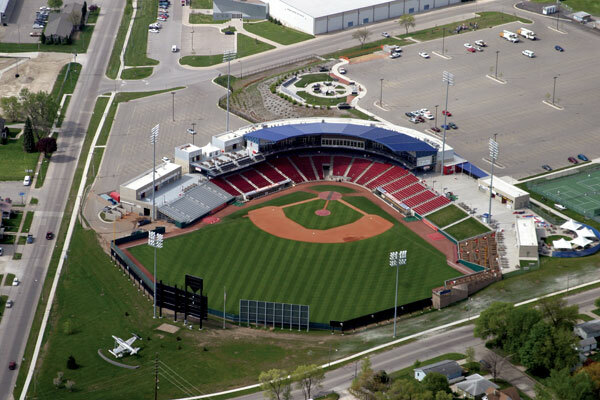 Veterans Memorial Stadium hosted the MWL All-Star Game in 2004 and 2016, and the American Legion World Series in 2006, in addition to concerts and high school and amateur baseball games. Starting in 2019, the stadium will host the NCAA Division III Baseball World Series. Over 80 extra events each year have more than 250,000 people visit Veterans Memorial Stadium each year.